Like most pregnant women, I tend to wake up at least once in the middle of the night because of baby sitting on my bladder. So late last night, my body was already in a period of light sleep, preparing to make its usual trek to the bathroom. Then I vaguely registered the sound of a child talking and playing around. "Deeeexter... go back to bed," I groggily moaned, wondering why he was awake at this time of night. Then I realized that the noises I thought were coming from the nursery were too abnormal to be Dexter's usual rustling about. Stumbling outside of the master bedroom without my glasses, I realized that K was still up, and the childlike sounds I had heard were actually from his new video game, South Park: The Stick of Truth. "K... what time is it?" I now groggily moaned at the correct culprit. "Uh, 3 am?" he replied sheepishly. Anyway, if you're an early riser like me, here are my top three tips for living agreeably with a night owl gamer. Don't nag him about staying or getting up late. Studies show that being an early bird or night owl is genetic, so neither inclination is better or more "right." Enjoy your mornings alone. With K fast asleep, sometimes I leave kiddo in the crib for a while so that I can have my quiet time with God, take a shower, or just have some private time alone. It feels good not being needed by anyone. Schedule in advance. 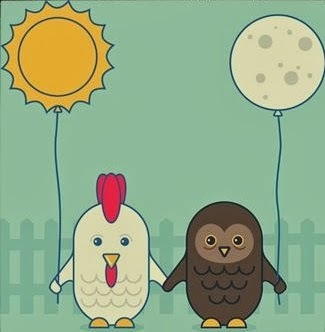 If you need your night owl to be up early in the morning (say, to take care of kiddo), make sure to let him know at least a couple days in advance so he can try to get to bed earlier over the next two evenings. Do you and your significant other have different circadian rhythms? Do you have any best practices for adapting to each other's different schedule? Night-owl-ness (that's totally a word) must be a common trait among the techie. My husband is a software developer and a night owl. We scoff at people who say that the secret to a good marriage is going to bed at the same time. Nope. Try again. I worked well for us when there were newborns in our house. I'd got to bed early and he'd get in one or two night feeds before he came to bed. That meant I could get a solid five-six hours of sleep in a row when I wasn't breastfeeding. We don't eat breakfast together, but we DO eat lunch and dinner together (he works from home and I am currently in between jobs) We get plenty of time together and his habits help me cope with his snoring. I NEED to go bed first and be dead asleep before he comes to bed and starts snoring! I am in the same boat as you! My husband is the consummate night owl. Letting him know the following day's schedule has saved us from many morning arguments. BTW, thanks for giving me credit for the picture! Beth - Thanks for making the oh-so-cute image in the first place! Totally agree about letting the husband know about plans beforehand. Seems to put him in a better mood overall. Oh the irony - I am reading this at 00:50. Our usual bedtime is 2:00 AM. I agree it must be a Techy thing. And the blessing and curse of working from home with a toddler. We just feel more productive at night because the toddler is a huge distraction during the day. I must confess I have been nagging my husband to try and go to bed early (at twelve), but in the end I broke that agreement because I had too much work to do.